Today is the day of issue for the Centenary of the Oil Palm Industry in Malaysia. The crowd was light with mostly regulars. The day was going to be exciting when 2 previously unissued setenant strip sheets of the Malaysian Serama and Places of Worship were put on sale! The queue built up rather quickly at the setenant strip counter! The unofficial information is that only 500 sheets were on sale for each of the Malaysian Bantam and Places of Worship. 300 were snapped up in a jiffy. 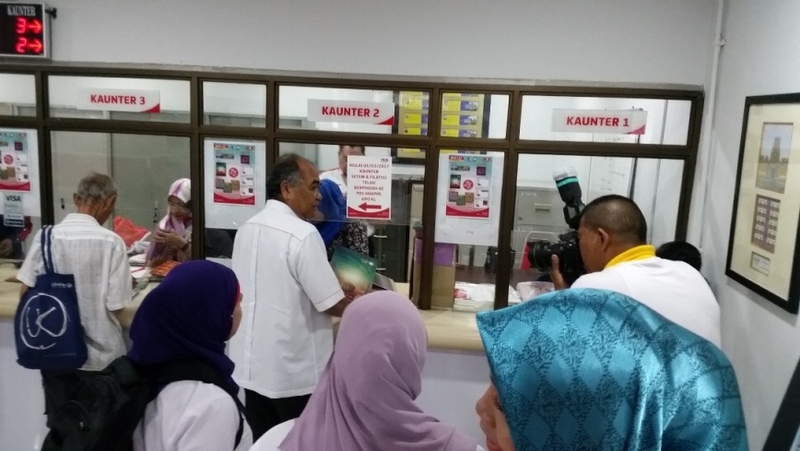 At about 08:40 am, Dr Ahmad Kushairi Din, the Director General of the Malaysian Palm Oil Board (MPOB), and his team came to buy the full folder set! 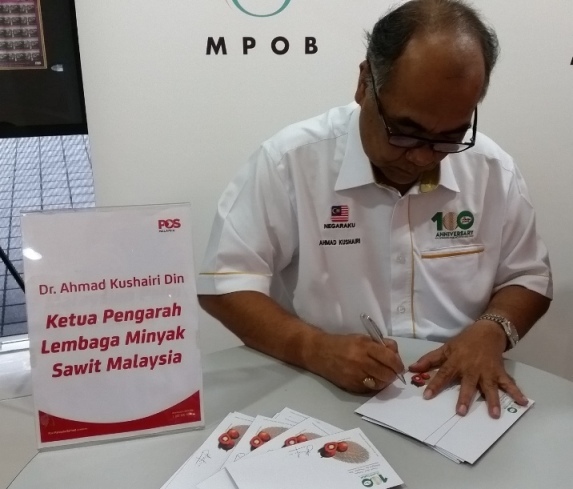 Dr Ahmad Kushairi Din then autographed some covers for the collectors. As the day was still early, many scrambled to have their covers autographed. Most of the covers were blank, straight from the sales counter! The autograph session was short as it ended at about 09:30 am. 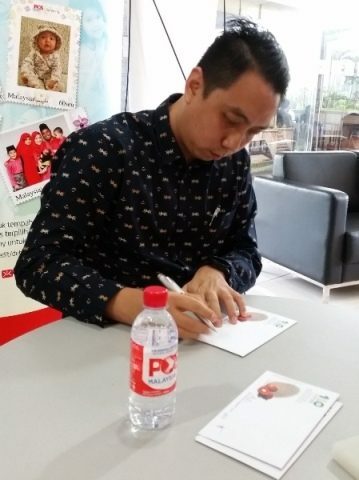 The designer, Mr Jason Phang from CN Communications Network Sdn Bhd, was on hand to continue the autograph session. It was then the start of the adventure of the day. MPOB was the main organiser for today’s event. 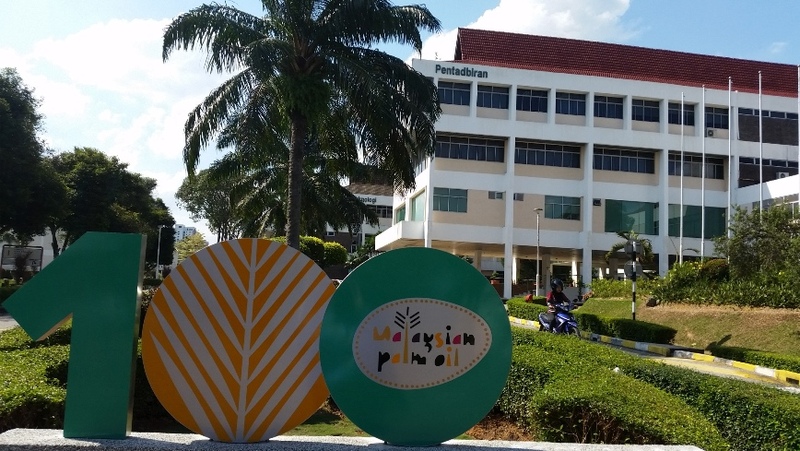 MPOB was formed in 2000 from the merger of Palm Oil Registration and Licensing Authority (PORLA) and Palm Oil Research Institute of Malaysia (PORIM). 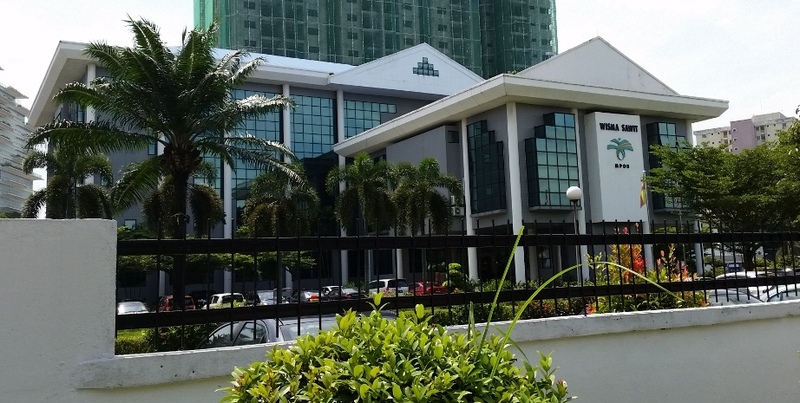 PORLA was formed in 1977 and continues to be based out of Kelana Jaya under the new MPOB in Wisma Sawit. PORIM on the other hand was formed in 1979. The research and the headquarters are still in the Bangi township. The headquarters is a sprawling complex. 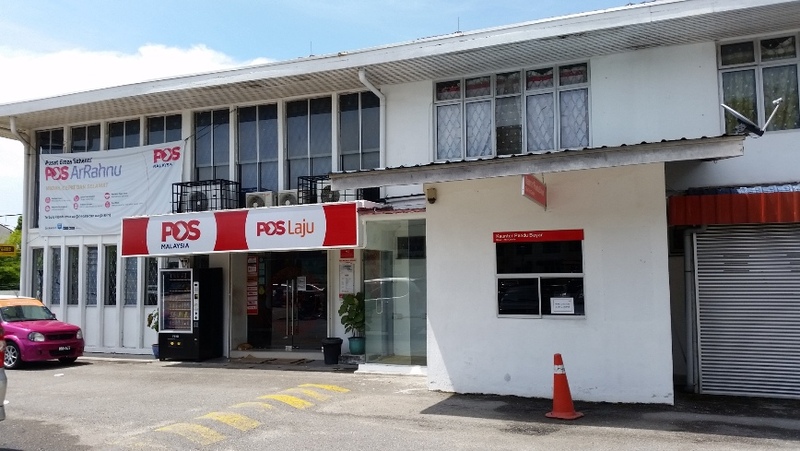 The nearest post office to the MPOB headquarters is the Bandar Baru Bangi Post Office. 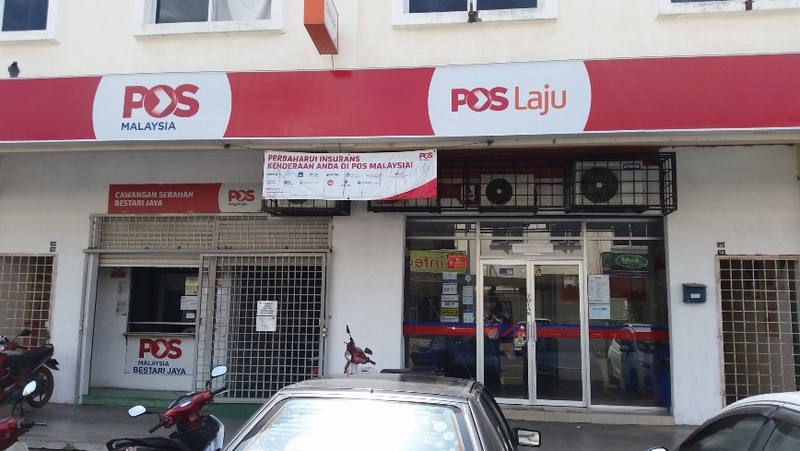 Kelana Jaya Post Office is the next best match as it is a stone throw away from Wisma Sawit. The main action was in Bestari Jaya and it was a long drive. 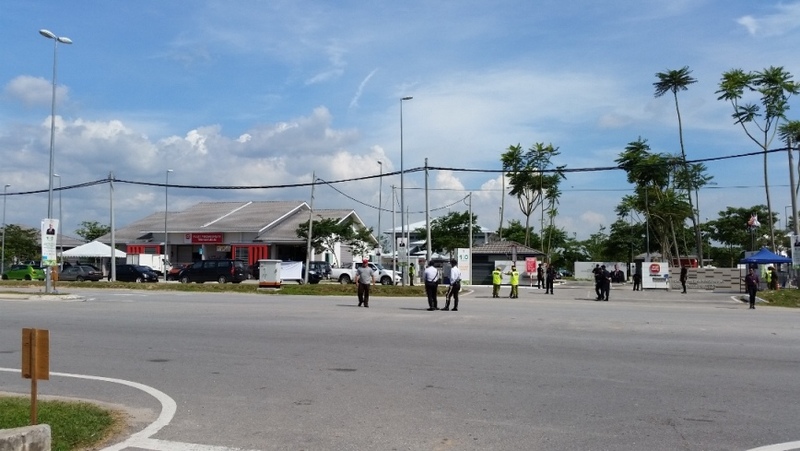 The Bestari Jaya post office is not visible from the road. It is tucked away a street hidden at the back. The main event as mentioned in the previous article, was to be held at the Tennamaram Estate. It is actually at the Tennamaram Estate Housing and Administrative Complex. Tennamaram Estate is the oldest commercial Oil Palm Estate. There is even a sign that proclaims this. There are also huge maps of the layout on site. The main event tent held over 5,000 guests! At about 04:00 pm, the Honourable Prime Minister arrived. 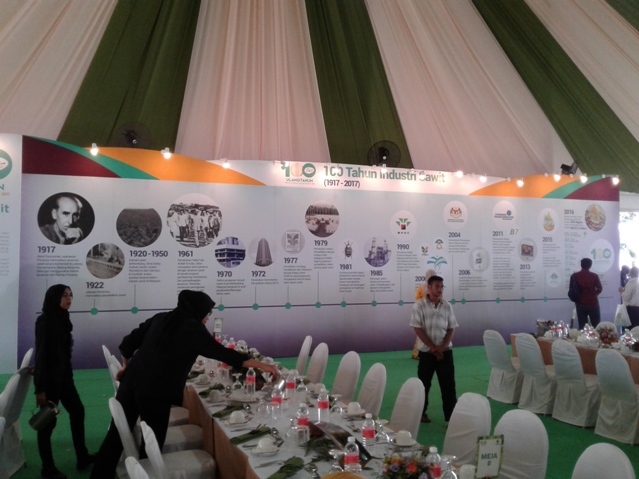 The back of the event tent was dedicated to the history of the planting of oil palm. Pos Malaysia had a booth of its own. Here is the booth. 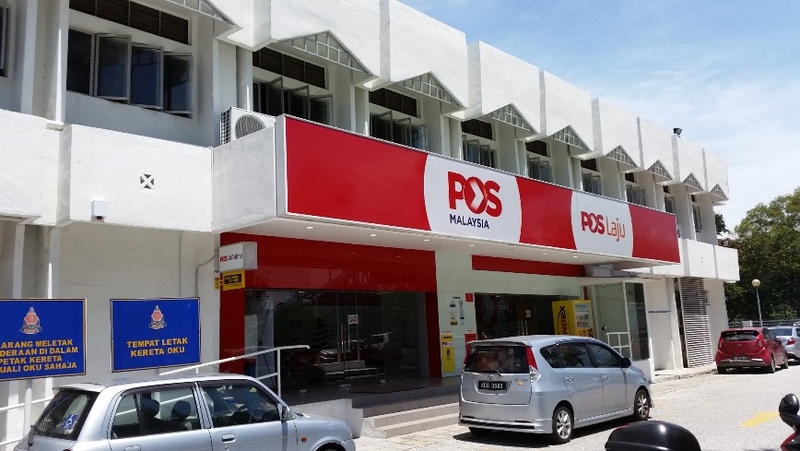 Pos Malaysia provided a special Bestari Jaya pictorial philatelic cancellation. Standing Order Deposit Account (SODA) members will receive the same special cancellation. It was soon time to go home. 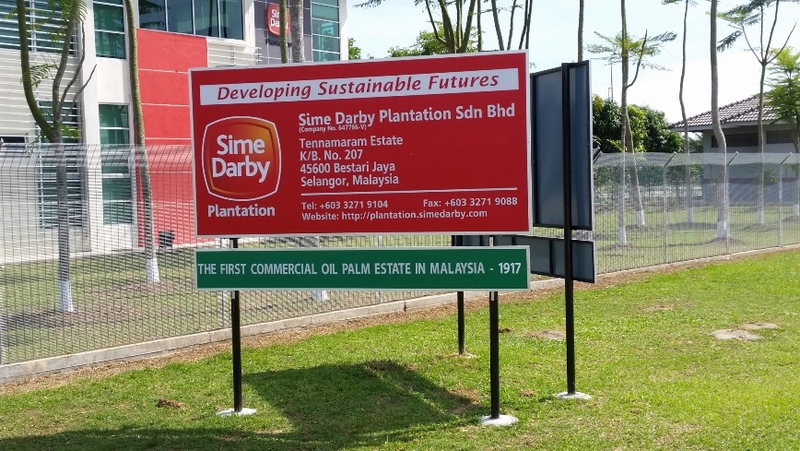 It was an eventful day tracing the history of oil palm and MPOB in the Klang Valley. Team 2 is down South in the Kulai area visiting the historical areas related to FELDA. Trivia: Henri Fauconnier stayed in Rantau Panjang. Where is Rantau Panjang? Send me your reply. The first and most accurate reply in the Comments below will receive a Commemorative Souvenir Programme Booklet cancelled with the Bestari Jaya pictorial cancellation. This trivia will close at 09:00 pm on 19 May 2017. Good luck! Rantau Panjang in the daerah Klang. 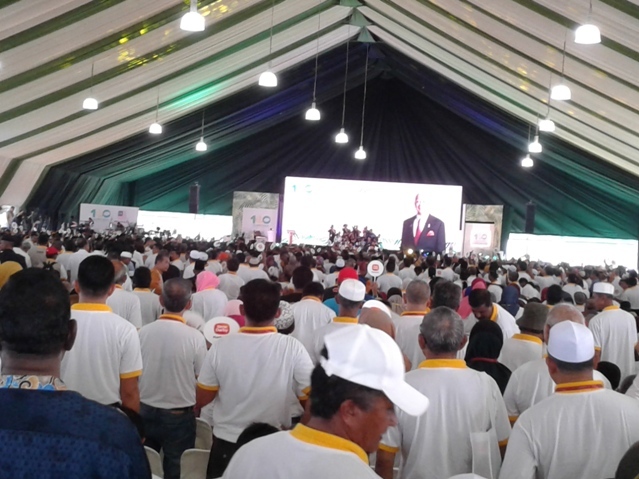 Rantau Panjang at Bestari Jaya, Kuala Selangor. Congratulations! Your answer is the closest. Please send me your address to: sky52200myfdc@gmail.com and your souvenir booklet will be on the way. Thank you for reading myfdc and participating! Rantau Panjang is a daerah (subdistrict/commune) and also a parliamentary constituency in Pasir Mas District, Kelantan, Malaysia. Rantau Panjang is located near the Malaysia-Thailand Border. Across the border is Su-ngai Kolok, Thailand.